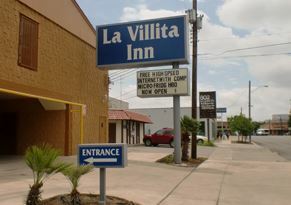 Welcome to La Villita Inn! La Villita Inn is a small boutique hotel nestled in downtown San Antonio, TX within walking distance to the Henry B. Gonzales Convention Center, the Alamo, Alamodome, and the Riverwalk. Restaurants, arts and crafts, shopping, and museums surround the hotel. All of the rooms are equipped with color televisions and computer and free internet access. The San Antonio International Airport is only 8 miles away.